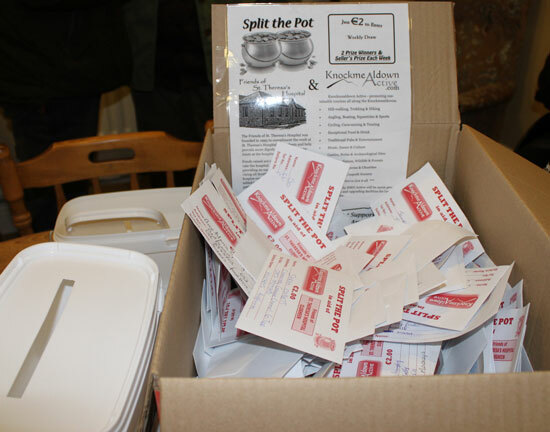 [col size=”one-half” position=”first” align=”left”]The draw for ‘Split the Pot’ was held on Monday April 29th in St. Theresa’s Day Care Centre, Clogheen. The winning tickets were, once again, drawn by Sr. Áine Power, a name synonymous with the Friends of St. Theresa’s and the Hospital for so many years. The winners in the second fortnightly draw in April were Kitty Saunders from Cahir who received €187.20, Ellen Sheehy from Ballyporeen who won €93.60 with Cahir Day Care Centre, once again, picking up the sellers prize of €31.20. The next draw will be on Monday, May 13th – again at the Day Care Centre in Clogheen. [col size=”one-half” position=”last” align=”left”]For those unaware of the initiative, Split the Pot is a fundraising activity organised by Knockmealdown Active in association with the Friends of St. Theresa’s Hospital in Clogheen to raise funds for the upkeep of the facility which is of such huge benefit to the entire region as well as providing Knockmealdown Active with funds for projects to improve the area along the Knockmealdown Mountain foothills.